On the eve of World War II, over 18,000 Jewish refugees escaped the holocaust in Europe to find refuge in Shanghai. At that time, almost all other countries closed their doors to the Jewish refugees. Shanghai generously gave them refuge. In 2007, the Hongkou District Government of Shanghai decided to commemorate this unique phase of history shared by the people of Shanghai and the Jewish refugees by opening the Shanghai Jewish Refugee Museum. A traveling exhibit from that museum will be on display at Union Station on Friday Oct. 17 and then at the Jewish Community Center in Overland Park for the next three weeks. Although there was much suffering in Shanghai during those wartime years by both Chinese residents and international refugees from all over the world, Shanghai in the 1930s and early 40s was also a time of great artistic expression. The musical scene was rich and varied. Jazz and western classical music grew in popularity, while Chinese traditional music took on new forms and audiences. The Jewish refugees also added Klezmer and Jewish folk music to the mix. 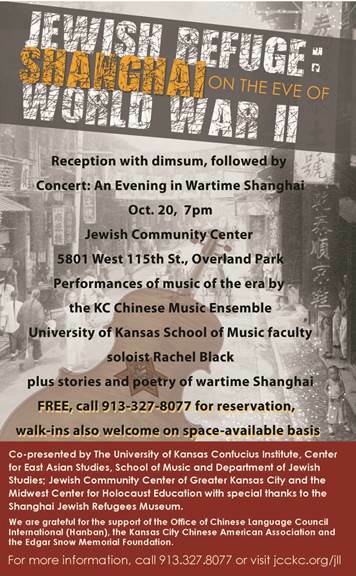 On Monday, October 20, we will honor the indomitable spirit of the musicians and artists of wartime Shanghai. Please join us to commemorate this little known chapter in the history of modern China and of the Jewish diaspora. Come and hear some Chinese music of the 1930s (Tianya genu! ), Prokofiev, Klezmer, Jazz, and Yiddish folk music, as well as poetry and stories of wartime Shanghai. Celebrate the international spirit of friendship that was formed through shared hardship and artistic expression during those years. Please let us know you are coming so that we can have an accurate headcount for the reception dimsum. Call 913-327-8007 or email jillm@jewishkc.org for reservations. Walk-ins will also be welcomed on a space-available basis. 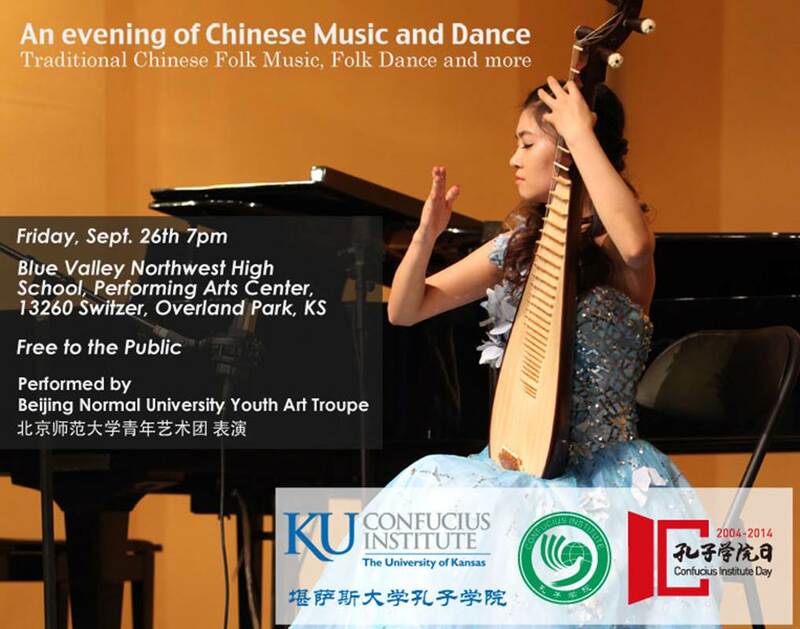 This event is sponsored by the Confucius Institute of the University of Kansas, in celebration of the worldwide 10th Anniversary of the Confucius Institutes. This performance is free to the public. For more information on the KU Confucius Institute, see www.confucius.ku.edu. In China, Kansas City is well-known as Edgar Snow’s birthplace. In 1936 his book Red Star Over China introduced Americans to the Red Army, fighting from caves in Yan’an county. Mary Clark and E. Grey Dimond founded Edgar Snow Memorial Foundation in 1974. Edgar Snow Symposia started in 1982, alternating biennially between Kansas City and Beijing, where they are organized by our partners, China Society for Peoples Friendship Studies. The theme of our 16th Edgar Snow Symposium is "Edgar Snow’s Kansas City: Where the Arts and Entrepreneurship Intersect". We will be hosting 30+ dignitaries from China, Mayor Sly James will be signing a new Sister Cities partnership with the Mayor of Yan’an. The Gala Banquet at the Intercontinental Hotel October 16 features Jane Chu. President of the National Endowment for the Arts. Robert Gamer, President of the Edgar Snow Memorial Foundation: Kansas City as hub of Railroads, Panama Canal, Jazz, Entrepreneurship, Education, the Arts Edgar Snow as a business manager; Snow and the Blue Bell Jazz Band; Working on Katy Line and riding the rails with Charlie White; Snow, Kermit Roosevelt, and the Panama Canal; Snow, education, and the arts.